Lisette Ranga, a camera marketing representative at Canon USA, indicates that units of the new Canon EOS 7D digital SLR will begin to ship from Canon distribution centers to retailers in the first part of next week (September 28th!). Factor in the logistics of shipping caseloads of cameras to a long list of dealers, and the Canon 7D should be in the hands of a decent quantity of pre-order customers in numerous U.S. states and Canadian provinces by the end of next week. Pre-order the new Canon EOS 7D on Amazon.com as it will be in very high demand, and supplies from Canon will be probably limited at first. Amazon will not charge your credit card until they ship the camera! – Canon U.S.A., Inc., a leader in digital imaging, today introduced a revolutionary camera that redefines the highly competitive mid-range DSLR product category: the Canon EOS 7D Digital SLR camera. Professional photographers and advanced amateurs have been demanding higher performance and more diverse functions in their cameras, and Canon has answered – with the new EOS 7D. Far more than a slight improvement from a previous model, the EOS 7D DSLR is a brand new product that stands on its own with new features never before seen in any Canon camera. Whether it’s shooting at eight frames per second (fps), focusing with the new Zone AF mode or recording 24p Full HD video, the EOS 7D DSLR camera satisfies the most rigorous professional requirements with durability, flexibility, high-resolution images and customizable controls. With its unprecedented out-of-the-box performance and high-end feature set, the EOS 7D is poised as the ultimate step-up camera for serious photographers or a second camera for professionals in the field. The Canon EOS 7D boasts significant EOS advancements including a completely new 19-point Autofocus system, a new Canon iFCL Metering System (Intelligent Focus, Color, Luminance) and a new Intelligent Viewfinder. 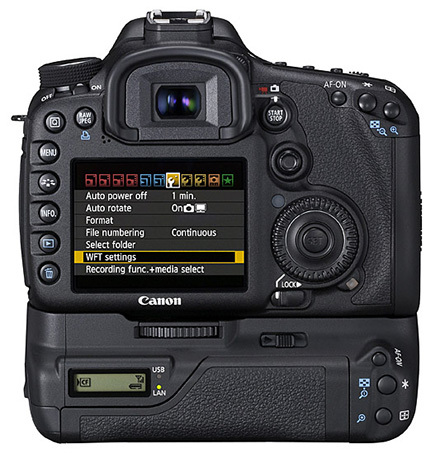 An 18-megapixel Canon CMOS sensor and Dual DIGIC 4 Imaging Processors fuel the EOS 7D’s 14-bit A/D data conversion and its ability to freeze fast motion in high-resolution with eight fps continuous shooting up to 126 Large JPEGS using a UDMA CF card, positioning this camera for the studio as well as the sideline. The EOS 7D captures beautiful low-light images with or without a flash, at occasions such as a dance recital or wedding reception, thanks to a wide range of ISO speed settings from 100-6400 (expandable to 12,800). In addition to its new still capture capabilities, the EOS 7D features Full HD video capture at 1920 x 1080 resolution with selectable frame rates of 24p, 25p or 30p. Native 24p recording helps videographers achieve a more cinema-style look for their footage without the need for post-processing. “The Canon EOS 7D represents a completely new chapter in digital photography and Canon product development. This camera stands alone as the most functional and innovative DSLR Canon has released to-date, bringing together all of the best professional features offered, along with numerous user requests at a price-point everyone can appreciate,” stated Yuichi Ishizuka, senior vice president and general manager, Consumer Imaging Group, Canon U.S.A. 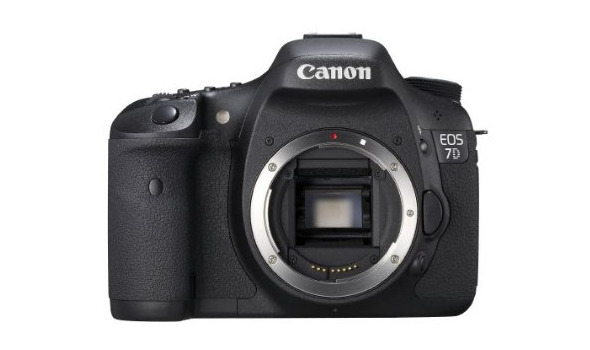 The Canon EOS 7D boasts the most advanced AF system ever seen in an EOS SLR. The completely re-designed system includes a new multi-axis cross-type 19-point AF grid, where the focusing points are evenly spread out across the image plane and clearly displayed through Canon’s new Intelligent Viewfinder. All 19 points are f/5.6-sensitive for both horizontal and vertical cross-type focusing, while the center AF point adds high-precision diagonal cross-type sensitivity for f/2.8 and larger aperture lenses. The Canon EOS 7D Digital SLR camera is the first EOS SLR to feature 19 cross-type focusing points that remain fully functional with maximum apertures as small as f/5.6, which brings the performance of the AF system to unprecedented levels for assignments as varied as fast-moving sports action or low-light wedding ceremonies. 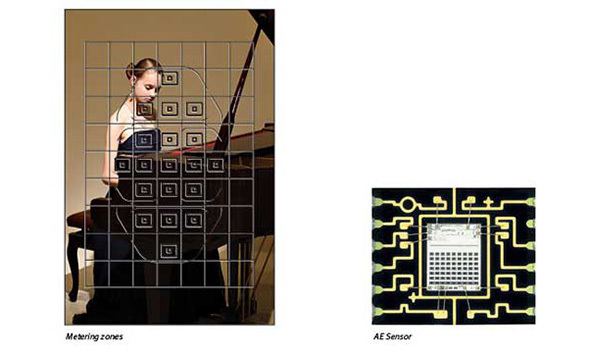 Spot AF mode reduces the size of a single AF point to focus on small subjects like an animal in a cage. AF Point Expansion mode uses a cluster of AF points adjacent to the selected AF point to automatically assist focusing on moving subjects, such as an athlete on the run. Zone AF divides the 19 AF points into five selectable focusing zones and makes it easier to achieve focus with subjects that are difficult to track with Single Point AF or AF point expansion, such as birds in flight. Additional AF improvements include a revised Automatic AF point selection sequence that allows a user to pick any one of the 19 AF points as a starting point for tracking moving subjects in AI Servo mode. (Previous EOS models required the subject to first be acquired by the center focusing point.) If the subject moves away, the camera will continue to track the movement with the remaining points and display the active focusing point in the viewfinder. Also, a time-saving feature is AF Point Switching, which allows photographers to select and register one AF point for horizontal compositions and a second AF point for vertical shooting, ideal for studio and portrait photographers. To complement the new AF system, the exposure metering system for the Canon EOS 7D has been completely re-designed to take color information into account, another first for an EOS system. Canon’s iFCL metering includes a 63-zone dual-layer metering sensor that reads both illumination and color for consistent results in all lighting conditions, keeping exposure levels stable from shot to shot, even as the light source changes. Canon’s new Intelligent Viewfinder uses a liquid crystal overlay to provide clear and precise displays of focusing points and zones, on-demand grid lines and a spot metering circle. The LCD overlay can also be illuminated in extreme low-light situations or turned off completely. The EOS 7D camera’s viewfinder includes a large all-glass pentaprism with an antireflective coating to maximize clarity and provide a brighter display. The EOS 7D’s Intelligent Viewfinder features 1.0x magnification with 100 percent coverage for accurate composition and checking of detail. Canon has blazed new trails in HD video capture with the 5D Mark II. Now, the EOS 7D takes DSLR video to new heights with Full HD capture featuring fully manual exposure control, and selectable cinematic frame rates for both NTSC (National Television System Committee) and PAL (Phase Altering Line) standards. Compatible with more than 60 Canon EF and EF-S lenses, the EOS 7D lets videographers take full advantage of the camera’s large CMOS sensor to achieve the dramatic frame composition they desire. At the heart of the EOS 7D are two key proprietary Canon technologies, Dual DIGIC 4 Imaging Processors and a large APS-C–sized CMOS sensor, helping to render stunning color reproduction, amazing depth of field and fine detail, even in low-light conditions. The Canon EOS 7D allows for three video recording modes – Full HD and HD in a 16:9 aspect ratio and Standard Definition (SD) in a 4:3 aspect ratio, all at selectable frame rates. The EOS 7D Digital SLR camera will record Full HD at 1920 x 1080 pixels in selectable frame rates of 24p (23.976), 25p, or 30p (29.97); 720p HD recording at 50p or 60p (59.94) and SD video at frame rates of 50p or 60p (59.94). The EOS 7D features a new dedicated button to initiate live view for both video and still shooting. Once engaged, the same dedicated button will start and stop video recording. Like the EOS 5D Mark II, the Canon EOS 7D Digital SLR camera provides users with the capability to use an external stereo microphone for professional audio effects or a built-in monaural microphone for convenience. A helpful new tool for architectural and landscape photography where angles and perspective are critical is Canon’s new built-in Dual Axis Electronic Level ( I could myself use this feature on any camera…please Canon! ), featuring an artificial horizon over the image on the rear LCD screen in Live View or in the viewfinder using illuminated AF points for easy leveling while shooting. The dual axis electronic level shows both horizontal roll and vertical pitch, making it easy to identify when the camera is in a fixed level shooting position and ready to take the shot. The EOS 7D’s pop-up flash features a built-in Integrated Speedlite Transmitter for control of multiple off-camera EOS Speedlites without the need for an external transmitter. This built-in wireless option is a compact and economical solution for studio and wedding photography with multiple flash set-ups. A new Intelligent Macro Tracking function helps reduce blur during macro shooting by recognizing when a macro lens is attached and automatically adjusting the AI Servo sampling frequency. This AI Servo adjustment accounts for camera movement forward and back, a typical occurrence when moving in close for a macro shot as photographers rock back and forth, or a flower blows in the wind. Once in your hands, you can immediately feel the ergonomic improvements of the Canon EOS 7D camera, starting with a new super-fluid body design with continuous curves outlining the top of the camera and a revised grip that fits better in a user’s hand. The camera has a new Quick Control Button, which opens an easy-to-navigate menu on the camera’s LCD screen. From this menu, users can adjust all camera settings including AF modes as well as set custom button functions, an insightful new feature that can easily customize each button’s function to the photographer’s preference. Another new feature is the RAW/JPEG toggle button providing quick dual-format shooting, allowing photographers to quickly add large JPEG or RAW file formats to their already selected shooting mode at the touch of a button. The Canon EOS 7D camera also features a new large, clear 3.0-inch solid structure Clear View II LCD screen with 920,000 dot/VGA resolution for enhanced clarity and color when viewing images. The camera’s nine internal seals enhance weather resistance, and its 150,000-cycle shutter durability positions the EOS 7D as a “workhorse” for professionals in any photography discipline. Canon is announcing the availability of the new WFT-E5A wireless file transmitter (WFT) exclusively for the EOS 7D Digital SLR camera. The WFT-E5A wireless transmitter offers professional photographers a wide range of digital connectivity options including IEEE802.11a/b/g and Ethernet, ideal for commercial and studio work. The WFT-E5A wireless file transmitter opens the door to new possibilities in remote and Geotagged shooting applications. Photographers can fire up to 10 cameras simultaneously from across the room or across the country while maintaining control over camera settings and remote live view on a laptop or smart phone. [i] The WFT-E5A wireless transmitter can also transfer and display images on DLNA (Digital Living Network Alliance) compatible televisions and photo frames. Geotagging is now possible via Bluetooth, using compatible GPS devices to append coordinate data to the images. The Canon EOS 7D Digital SLR camera is scheduled to be delivered to U.S. dealers at the end of September, and will be sold in a body-only configuration at an estimated retail price of $1,699.00[ii]. It will also be offered in a kit version with Canon’s EF 28-135mm f/3.5-5.6 IS USM zoom lens at an estimated retail price of $1,899.00[iii]. The Canon WFT-E5A wireless file transmitter is scheduled to be available in early November and sell at an estimated retail price of $699.99[iv]. 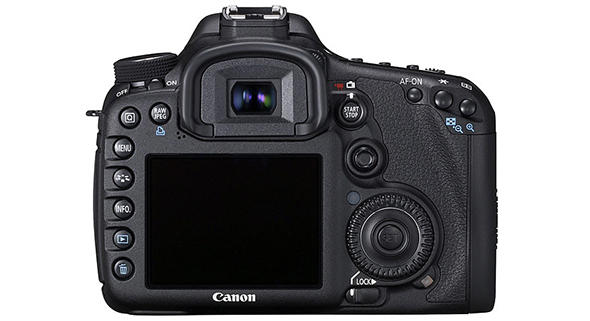 Canon packed its most advanced technologies into the EOS 7D’s AF system. With 19 high precision, cross-type AF sensors, any of which can be selected automatically or manually, the EOS 7D is equipped to handle even the trickiest of focus situations with ease. The high-speed microcomputers in the EOS 7D use advanced algorithms that help ensure the fastest, most accurate AF performance under the widest variety of conditions. In addition, Canon’s Light Source detection AF automatically compensates the focus by taking into account artificial lighting sources and making appropriate adjustments and the EOS 7D’s new Intelligent Macro focusing tracks the object or the cameras movement when shooting close-up, to ensure focus is never lost. AF modes can be customized to suit the situation, ensuring reliable focus, every time. Photofocus/Scott Bourn si doing a contest where you can actually win a Canon 7d!